The cast brooch is near-complete, missing the pin and part of the outside of the frame (with a length of 33.8mm, a width of 30.0mm and a weight of 4.1g). 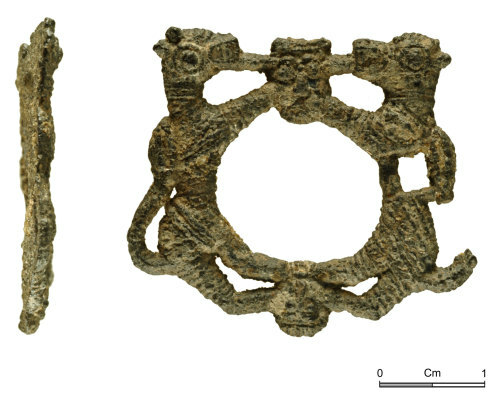 The openwork brooch frame has a sub-circular central opening (16.4mm wide and 14.8mm long) around an zoomorphic openwork frame of D-shaped section (2.4mm thick). The frame depicts an unusual scene that is difficult to interpret. Both sides comprise a standing beast, probably lions or dogs with the tails looped upwards and returning at the shoulders. The tail on one side is now lost. Both front and back paws of both beasts rest on human heads and both beasts are biting on a strand connected to the temple of the head at the centre. The missing brooch pin was secured through a near-square hole (3.9mm x 3.3mm) through the body of one of the beasts with no corresponding notch opposite. The beasts are depicted with diagonal strap-like double-ribs across the body and around the neck, possibly a collar. The beasts have teeth bared and large protruding circular eyes, while pulling on a strip or possibly the ears of the unfortunate head. Both heads have raised eyes and nose and are depicted with hair and beard. The rear of the brooch is flat and not decorated. The surface is corroded and coarse with a dark-grey patina. The brooch form and decoration are unusual, with the imagery perhaps more troubling than is usual on items of personal adornment. It is possible the scene is a representation of the fate of early Christian martyrs, thrown to the lions.